A largely unknown provision in a 2016 overhaul of Arizona’s campaign finance laws allows statewide candidates to double their contribution limits, and Gov. Doug Ducey has made good use of it. The 2016 law, penned by Secretary of State Michele Reagan’s office, defines an election cycle as a two-years period. Arizona’s campaign contribution limits currently limit individuals from giving a maximum of $5,100 to a candidate each election cycle. For legislative candidates, who serve two-year terms, the law changed nothing. But under the new law, offices with four-year terms — governor, secretary of state, attorney general, state treasurer, superintendent of public instruction, mine inspector and Corporation Commission — technically span two election cycles. That means candidates for statewide office can collect maximum contributions from the same donor twice, as long as those contributions come in different two-year election cycles. In order to capitalize on that new campaign finance loophole, a statewide candidate’s campaign must begin at least two years before his or her election, which primarily limits its use to incumbents, who often begin raising money for their re-election campaigns shortly after taking office. And, of course, a candidate must be a strong enough fundraiser to collect two maximum contributions from the same person. Ducey, a prodigious fundraiser, has been the primary beneficiary of that provision. 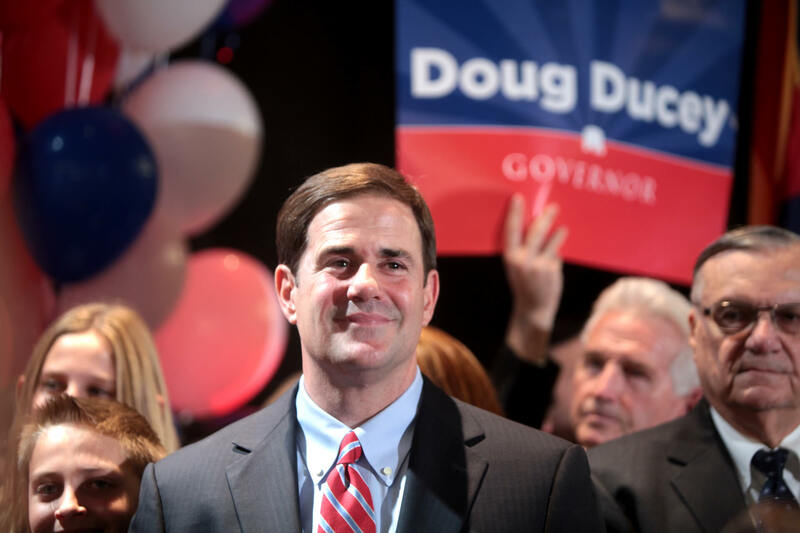 According an Arizona Mirror analysis of the governor’s campaign finance reports dating back to 2016, the double-dipping provision has allowed Ducey to raise at least $200,000 more than he would have been able to under the old laws. Because the contribution limit was set at $5,000 during the 2016 election cycle, Ducey was able to collect as much as $10,100 from some supporters. Much of this money was raised through the Ducey Victory Fund Committee, a joint fundraising venture by the governor and the Arizona Republican Party. The contributions that go to Ducey via Ducey Victory Fund are subject to contribution limits. Ducey has raised more than $5.6 million for his re-election campaign, and the $200,000 raised under this provision represents only about 3.6 percent of what he has raised. Attorney General Mark Brnovich was also able to take advantage of the new law, though not nearly to the same extent as Ducey. Brnovich raised an additional $25,200 thanks to the effective doubling of the contribution limits.